This is an album Iron Maiden should have made in the late 1980s or early 90s, instead, solid rockers from central Florida released it in 2004. In what can only be described as a labor of love of the band’s driving force, Jon Schaffer, this CD blends heavy doses of history with a thoughtful mix of emotions brought on by the tragedy of September 11, 2001. The CD starts with an electric version of the “Star Spangled Banner” and segues into “Declaration Day”, a look back at the birth of the United States and the sacrifice it took to create this country. The very next track, “When The Eagle Cries”, is a touching nod to 9/11. The rest of the CD leading up to the three parts of “Gettysburg” touches on various historical and military subjects such as the Special Forces in Greenface, the ruthless Hun leader “Attila”, dog-fighting in WWI with the “Red Baron/Blue Max”, and the disgust of the Colonial soldier at “Valley Forge” if he could see what this country has become since the days he and his brothers sacrificed their lives for our freedom. If the new Iron Maiden release left you wanting, thinking there could have been more, this CD will cover all their misses and then some. 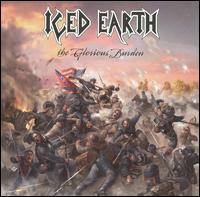 It would be a shame for the world at large not to hear this offering by Iced Earth. Reviewed by Brutus for Sleaze Roxx, October 2006.